Juventus celebrating their Coppa Italia trophy. 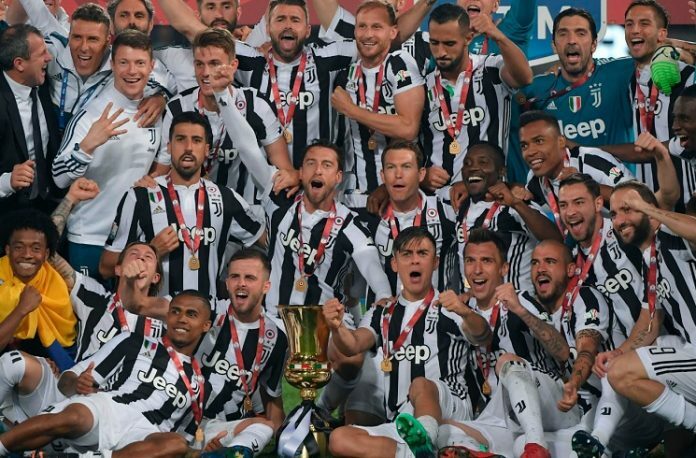 Another trophy being won by an Argentine (or in this case, two) as Paulo DYBALA and Gonzalo HIGUAIN lifted the Coppa Italia trophy while Lionel MESSI continues to score. 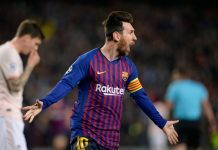 Following another clasico goal against Real Madrid on the weekend, Lionel MESSI added to his highlight reel of sensational goals. This time in a 5-1 win against Villarreal. A lovely one-two with the legendary Andres INIESTA meant that Lionel made it 3-0 for the Liga winners. Off to Italy, Paulo DYBALA started the match and came off for Gonzalo HIGUAIN in the 83rd minute after putting in a great performance for Juventus in their 4-0 win against AC Milan. Lucas BIGLIA, who sustained an injury last month, was an unused substitute. Here’s a lovely piece of skill by DYBALA which nearly resulted in a goal. 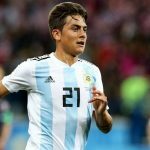 All four Argentine players are expected to make Jorge SAMPAOLI’s Argentina squad for the World Cup, with BIGLIA’s fitness being the only worry. If there is one thing Sampa should do is ORDER players to move when Messi has the ball. That is what Barca does. Offer him passing opportunities and create spaces. In the NT everyone stops and watches Leo. If Argentina go 4-2-3-1 in WC and Messi Dybla both plays is there any possibility they will cut each others role on the pitch. 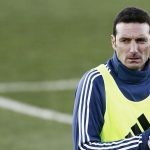 Only a fool would use Mercado and Salvio as right back we can not convert winger into right back.I do not think Sampoli would do that mistake.He is wise,bringing best player from the domestic league.It might take time but everything is coming on the way but very slowly so he is not gonna to make mistakes.With Messi everything is possible.If with Messi’s help this mediocre Barcelona can remain undefeated in LA liga why Argentina would not be undefeated in world cup. With Messi, even Argentina has been rarely beaten.